Stock photo of waterfront properties along the shoreline of Lake Superior near the city of Thunder Bay, Ontario, Canada. 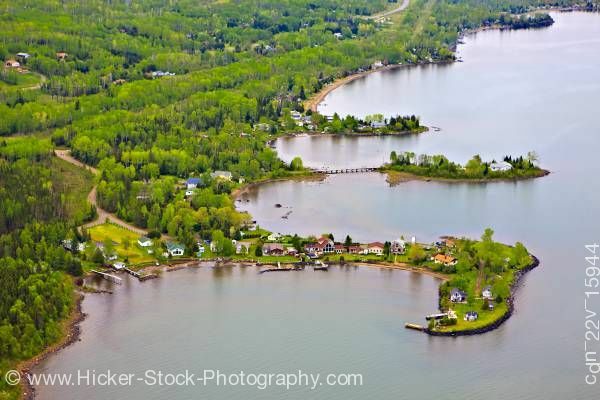 This stock photo includes an aerial view of waterfront properties situated along the shores of Lake Superior near Thunder Bay, Ontario, Canada. European settlement in the region began in the late 1600s with a French fur trading outpost on the banks of the Kaministiquia River. The city was formed in 1970 by the merger of the cities of Fort William, Port Arthur and the geographic townships of Neebing and McIntyre. Its port forms an important link in the shipping of grain and other products from western Canada through the Great Lakes and the Saint Lawrence Seaway to the east coast. Forestry and manufacturing play important roles in the city's economy, but with their decline in recent years they are being replaced by a "knowledge economy" based on medical research and education.